It’s no secret that I love coloring and drawing. From an early age, I would take out Ed Emberley drawing books from the library just to doodle and draw for fun. My boys have definitely caught the drawing for fun bug. We have a great collection of drawing books that the entire family enjoys. When Sixth&Spring contacted me to review the new Christopher Hart book for kids, we said yes and could not wait to check it out. Drawing Animals Shape by Shape is broken up into different segments by animals of course.There are dogs, cats, farm animals. woodland creatures, safari animals, feathered friends, water animals, reptiles/bugs, dinosaurs, and more fun options in the table of contents. 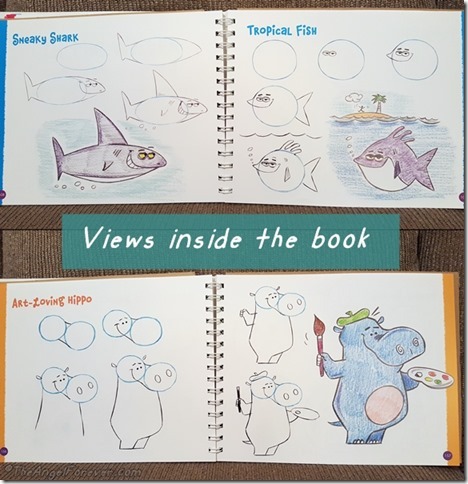 Kids of all ages will see the easy to follow step by step directions using simple shapes layered onto of one another until you see the featured animal friend before you. It truly is fun to see how an oval with some rectangles, circles, and triangles makes Fido the dog’s face come to life. 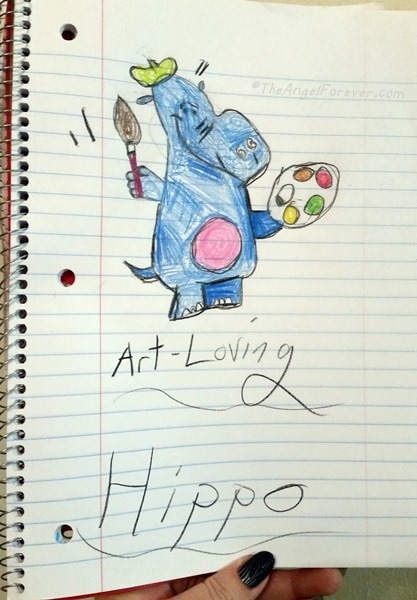 The spiral bound book is filled with over 100 cartoon creatures for your budding artist to replicate. Moments after the book arrived, the kids ran off with it. They immediately pulled out some notebooks and colored pencils to practice drawing. After some time, they came over to show me several of their drawings. 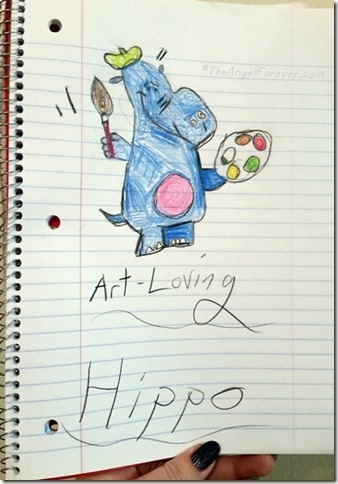 One of the first that was completed was the very fitting Art Loving Hippo. 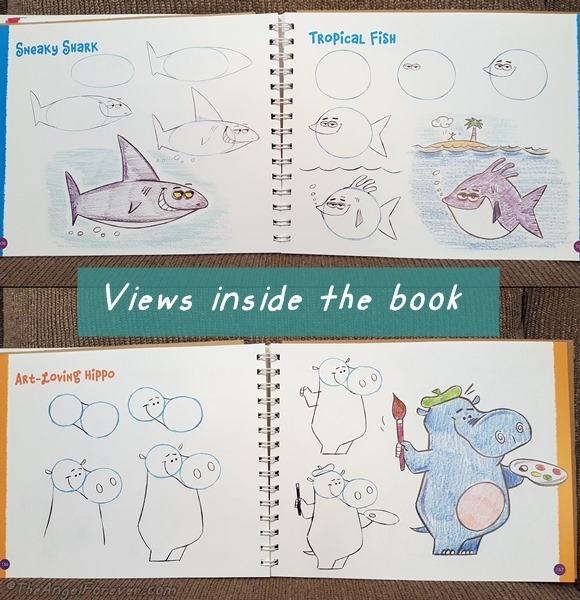 The animals within the book would be great for kids to draw and tell stories, or to create their own fun cartoon stories. The lively creatures within actively engage even those that don’t think they can draw. This book will be on my birthday and holiday gift giving list because it will appeal to a wide variety of kids. Pair this up with a nice drawing notebook, colored pencil set, and voila the perfect creative package. I know my boys are already asking about the original Drawing Shape by Shape – Create Cartoon Characters with Circles, Squares & Triangles. The book has been a great addition to our rainy weather activities and will be fantastic on snow days that are bound to happen in a few months. 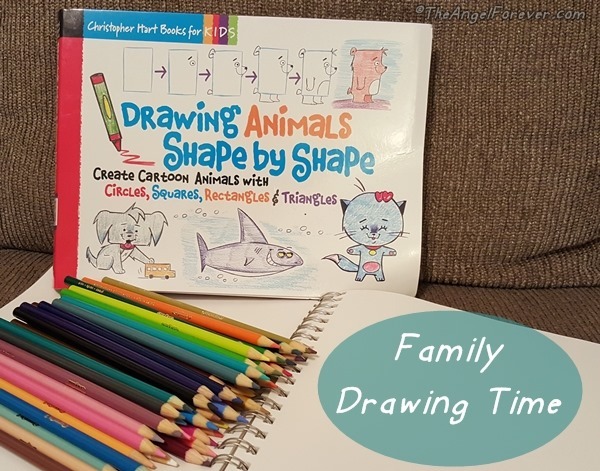 Would you like to win your own copy of Drawing Animals Shape by Shape? One random person that answers the following question will receive a copy of the book. What type of drawing book would you love to see by Christopher Hart next? Remember he already has made over 50 drawing books! As always, Tuesday Tales is all about sharing our love of books. What are you currently reading or what was the last book you read? This giveaway ends on Friday, October 23 at 11:50 PM ET. Only open to US and Canadian residents that are 18 and older. Disclosure: As noted above, I received this family drawing book from Sixth&Spring Books to review. No other compensation was received and all opinions are my own. My one son would like the animals and manga but I think he should do a book on vehicles.